Saturday’s nine-game slate provided plenty of highlights, including James Harden, Russell Westbrook and Paul George all posting monster numbers in an entertaining showdown between two of the league’s most dynamic offenses. After recapping the important storylines from Saturday, we’ll wrap up the Dose by taking a quick look at a handful of players that are facing injury issues for Sunday’s games. Rudy Gobert was remarkably effective and efficient in Utah’s victory over the Spurs on Saturday. Rudy stuffed the stat sheet with 21 points, 13 rebounds, four assists, four steals and two blocks in 31 minutes. That’s four straight double-doubles for Gobert, and he’s averaging 18.0 points, 12.8 boards, 1.0 steals and 2.3 blocks while shooting a scorching 69.7% from the field during this four-game stretch. Trae Young scored 20 points (on 8-of-15 shooting), dished out a game-high 11 assists and tacked on four treys and two steals. Young has tallied at least 20 points and eight dimes in six of the Hawks last eight games. He’s also shot 50 percent or better from the floor in five of those contests. It was assumed by many that the Pelicans would sit Anthony Davis on Saturday, as it was the second night of a back-to-back. Well, not only did AD play, he logged 34 minutes, which was very encouraging. Davis finished with 14 points, 16 rebounds, six assists, two steals and two blocks. Fantasy owners would be ecstatic if Davis continues to suit up every game, even if he only plays around 30 minutes a night. Kemba Walker poured in 37 more points on Saturday. Playing against the up-tempo Hawks, Kemba got up 27 shots (making 13) and tacked on one rebound, seven assists, one steal, two blocks and nine 3-pointers in 37 minutes. Walker has been a beast this month, averaging 31.8 points, 5.2 boards, 7.2 dimes, 1.4 steals and 5.2 treys… Jeremy Lamb also had a terrific all-around game, scoring 24 points on 8-of-14 shooting to go along with six rebounds, seven assists, three steals, one block and four 3-pointers in 36 minutes. Over the Hornets last four games, Lamb is averaging 18.5 points, 6.0 boards, 2.5 dimes, 1.8 steals, and 1.5 treys. Another night, another 40-burger for James Harden. The Beard was 11 for 28 from the field, 6-of-16 from 3-point range, and made 14 of his 15 free throw attempts on the way to 42 points. The only negative was Harden adding just two rebounds, one assist, one steal. It was the 29th straight game in which he has scored at least 30 points, which is two shy of Chamberlain for the second-longest streak in NBA history... Chris Paul flirted with a triple-double, tallying 18 points (5-of-12 FGs, 6-of-7 FTs), ten rebounds, nine assists, two steals and two 3-pointers in 35 minutes. 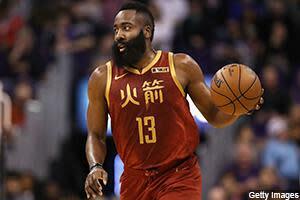 Saturday was the 70th time in Harden’s career that he’s scored at least 40 points; however, it was the first time in those 70 contests an opponent ever outscored him. Yes, Paul George erupted for 45 points, to go along with 11 rebounds, three assists, one steal, two turnovers and six 3-pointers in OKC victory over Houston. PG-13 was 12-of-22 from the floor and 15-of-18 from the stripe. George is averaging a whopping 37.7 points, 6.1 triples and 2.4 steals over OKC’s last seven games. Not to be outdone, Russell Westbrook posted his ninth consecutive triple-double, scoring 21 points with 12 rebounds, 11 assists, two steals, one block, one 3-pointer and ten turnovers in 38 minutes. The nine straight trip-dubs ties Wilt Chamberlain for the longest streak in league history. Westbrook’s poor FG% and high turnover rate are certainly not ideal, but Russ is averaging a mind-boggling 14.1 assists and 13.1 rebounds over OKC last nine games. Incredible. Donovan Mitchell had another solid all-around performance: 23 points, five rebounds, five assists, three steals and two trifectas… Derrick Favors (11 points, ten rebounds) double-doubled in just 19 minutes off the bench… Ricky Rubio totaled 16 points (7-of-13 FGs), six boards, six dimes and zero turnovers. Larry Nance continued his impressive play with 16 points, ten rebounds, two assists, one steal, two blocks and three 3-pointers in 39 minutes. Nance is one of the more underrated fantasy players in the league this season. Over his last five games, he’s averaging 12.2 points, 12.8 rebounds, 1.2 steals and 1.0 treys. Although he seems to fly under the radar, Nance ranks 62nd overall in nine-category formats… Marquese Chriss started in place of Kevin Love (rest), and tallied seven points, three rebounds, two assists, one steal and one 3-pointer in 24 minutes. The rebuilding Cavs will give the former top-10 pick plenty of opportunities to prove he’s an NBA player over the final two months of the season. Cory Joseph messed around and almost recorded a triple-double on Saturday, scoring 10 points with nine rebounds, ten assists and one steal in 31 minutes. CoJo has played well of late, but his minutes will be scaled back with the Pacers on the verge of signing free agent Wesley Matthews… Myles Turner appeared to injure his right knee in the third quarter. He fell to the floor in pain and limped to the locker room, but then returned to the contest in the same quarter, to the relief of Pacers fans and Turner owners everywhere. He finished with 14 points, eight rebounds, three blocks and one 3-pointer in 22 minutes. John Collins snapped out of a mini-slump by scoring 21 points on 8-of-12 shooting on Saturday. He also added five rebounds, one steal, one block and four turnovers… Kevin Huerter shot 7-of-9 from the floor en route to 17 points with four rebounds, one assist, one steal and three 3-pointers in 34 minutes. Kyle Lowry was deadly from downtown in the Raptors victory over the Knicks at MSG. Lowry knocked down 5-of-7 from 3-point range and finished with 22 points (6-of-10 FGs, 5-of-6 FTs), five assists, four rebounds, two steals and two blocked shots in 34 minutes… Kawhi Leonard (knee) returned to action but had a rare off night. Leonard logged 32 minutes but totaled just 11 points on 4-of-15 shooting, with six assists, five rebounds, one steal and one three-pointer… Serge Ibaka was spectacular: 15 points (5-of-10 FGs, 5-of-6 FTs), 13 rebounds, four assists and one steal in 29 minutes… Marc Gasol made his Raptors debut and tallied seven points (3-of-7 FGs), six rebounds, two steals, one assist and one blocked shot in 19 minutes. Gasol came off the bench on Saturday. We’ll see if that continues going forward. Dennis Smith Jr. struggled with his shot once again (making just four of his 17 field goal attempts) on Saturday, but did notch 13 points, six assists, four rebounds, three steals, one three-pointer and only one turnover in 30 minutes. DSJ’s usage rate has consistently been hovering around 30% since arriving in New York, and it should remain sky-high for the rest of the season. Smith Jr. has dished out at least six assists in each of his last six games. Only two Knicks this decade have handed out more than five assists in six consecutive contests: Jeremy Lin and Raymond Felton… Mitchell Robinson is rolling right now. He scored a career-high 15 points (7-of-9 FGs) with seven rebounds and three blocked shots in 22 minutes Saturday. That’s three straight good games for Mitch Rob, who is averaging 13.0 points, 7.7 rebounds and 2.7 blocks during this stretch... DeAndre Jordan ripped down 18 rebounds and added ten points (4-of-8 FGs, 2-of-6 FTs), three assists and one blocked shot in 26 minutes. Danilo Gallinari looked good: 19 points (5-of-10 FGs, 7-of-7 FTs), ten rebounds, four assists and two 3-pointers in 29 minutes. With Tobias Harris in Philly, Gallo will be the focal point of the Clippers offense and will be a fantasy star as long as he can avoid the injury bug… Ivica Zubac started at center and racked up 12 points (5-of-10 FGs, 2-of-3 FTs) with nine rebounds and three blocks in 23 minutes. Go scoop him up if he’s still floating around your waiver wire… Landry Shamet made a very positive first impression for L.A., scoring 17 points (5-of-9 FGs, 3-of-4 FTs) with two rebounds, three assists, one steal and four 3-pointers in 27 minutes. Montrezl Harrell had 21 points and six rebounds in 29 minutes. With Marcin Gortat and Tobias Harris out of the picture, ‘Trez’s fantasy value is spiking. Ivan Rabb totaled 10 points, nine rebounds, three assists and no turnovers in 28 minutes on Saturday, but the more important news was coach J.B. Bickerstaff telling reporters after the game that he’s sticking with Rabb in the starting lineup for the time being. “I think he’s earned it,” said Bickerstaff. The arrival of Jonas Valanciunas will eat into his playing time, but Rabb should be rostered in fantasy formats. He’s averaging 12.8 points and 7.2 boards over the Grizzlies last five games… Joakim Noah came out of nowhere to score a season-high 19 points and grab 14 rebounds with three assists and one turnover in 30 minutes... Delon Wright had seven points, one rebound, two assists, one steal and one turnover in 23 minutes in his Memphis debut. Bradley Beal’s scoring surge continued on Saturday, as he put up 31 points (13-of-21 FGs, 4-of-4 FTs) with four assists, four steals, two rebounds and one three-pointer in 34 minutes… In a classic “Revenge Game,” Jabari Parker scored 20 points (9-of-15 FGs, 2-of-2 FTs) with six assists, five rebounds, two blocked shots and one steal in 35 minutes. You know Parker wanted to stick it to the Bulls in Chicago, and Parker did just that in the Wizards 134-125 victory. I think Parker has a chance to put up solid numbers the rest of the season… Bobby Portis also had plenty to prove against his former squad on Saturday. BP played 29 minutes and racked up ten points (4-of-11 FGs, 2-of-3 FTs), 12 rebounds, four assists and two blocked shots. Portis’ fantasy value is on the rise in Washington. Nikola Vucevic only logged 26 minutes in the Magic’s blowout victory over the Bucks, but still managed to rack up 15 points, 17 rebounds, one block and one 3-pointer… Jonathan Isaac was at again as well, tallying a team-high 17 points (on 7-of-12 shooting) to go along with six rebounds, two blocks and three 3-pointers. It’s also important to note that Isaac was one of only two Orlando players to log more than 30 minutes. Over the Magic’s last ten games, he’s averaging 11.3 points, 7.8 boards, 1.4 dimes, 1.2 steals, 2.0 blocks and 1.1 treys with solid percentages. This is what we were hoping for when he was hyped up at the start of the season. Isaac has a chance to post top-50 overall value in nine-cat formats the rest of the way. Zach LaVine has been surprisingly efficient of late, and that trend continued on Saturday. Lavine was 11-of-17 from the floor for 26 points with six assists, four rebounds and one steal in 36 minutes. Over his last five games, Zach is averaging 24.5 points, 5.0 boards and 5.3 dimes, while shooting a sweltering 56.7 percent from the field… Lauri Markkanen posted his third straight double-double, scoring 20 points with 11 rebounds, four assists and one three-pointer in 32 minutes. Giannis Antetokounmpo (right knee soreness) did not play in Saturday's game vs. Orlando, the second night of a back-to-back. The Bucks have sat Giannis sporadically this season to limit the wear-and-tear on the Greek Freak’s knee. Prior to Saturday, he had missed a total of three games in 2018-19, but has never sat out consecutive contests. Hopefully, he'll return to the lineup Monday vs. the Bulls. Kyrie Irving (right knee sprain) exited Saturday’s game in the second quarter after suffering what appeared to be a non-contact injury. He went to the locker room a few minutes before halftime and was ruled out of the game a short while later. Afterward, coach Brad Stevens said that Kyrie’s knee bucked a bit will undergo further testing on his knee to better determine the status of his injury. If there’s any good news to be had, it’s that the left knee is the one Irving had surgery on last season. We’ll wait for another update before we start panicking. However, Irving owners should definitely grab Terry Rozier as insurance. Rudy Gay (left ankle sprain) was not able to play Saturday. Before injuring his ankle on Thursday, Gay had scored in double-figures in each of San Antonio's last 12 games and is averaging 17.0 points, 5.7 rebounds and 1.1 treys during that 12-game stretch. Nikola Mirotic (right calf strain) was ruled out for Saturday's game. Mirotic has been sidelined by a calf injury since January 23rd and missed most of December as well. The Bucks are in no rush to push him into the lineup, but it's possible that Miortic will make his Milwaukee debut Monday vs. Chicago. Jahlil Okafor (left ankle sprain) did not play against the Grizzlies on Saturday. It was his second straight game on the shelf. Okafor’s fantasy value took a big hit with Anthony Davis remaining in New Orleans after the trade deadline. Elfrid Payton (right ankle sprain) did not play Saturday vs. Memphis. It was the seventh consecutive game Payton has missed due to the ankle injury, and it looks as though the Pels may choose to sit him out until after the All-Star break. Cedi Osman (right ankle) was ruled out of Saturday's game vs. the Pacers. Osman initially injured his ankle last weekend and has missed each of the Cavs three games since. Because he was rolling prior to the injury (averaging 24.3 points, 6.3 rebounds, 3.8 assists and 3.8 treys in his previous four contests), I’d prefer to hold onto him. Doug McDermott (ribs) did not play in Saturday's game vs. Cleveland. McBuckets has missed each of the Pacers last five games, but the fact that he was initially upgraded from doubtful to questionable on Saturday morning’s injury report is a good indication he’s nearing a return. Chandler Parsons has agreed to rejoin the Grizzlies after the All-Star break and return to the lineup. Parsons was medically cleared in late December, but coach J.B. Bickerstaff did not insert him into the rotation. As a result, Parsons left the team to train on his own in early January. Memphis tried to trade him, but no team was willing to touch the $38 million owed to him through 2020. Parsons has been injury-riddled and unproductive since signing with the Grizzlies. He should be left on waivers in fantasy leagues. Markelle Fultz (shoulder) remains without a timetable. Asked about when Fultz might return to game action, Magic president of basketball operations Jeff Weltman said: “We’re going to do it right. We are not going to do it fast. We look forward to getting him in here, getting our arms around him, [and] understanding everything that he’s dealing with. Getting him through that, it’s our job organizationally, from the performance directors to the coaches to all of us to put him in a position to succeed. And however long that takes, that’s how long it’ll take." Devin Booker (hamstring) is listed as probable for Sunday's game vs. the Kings and coach Igor Kokoskov said there is a "very good" chance Booker will play. Booker has missed each of the Suns previous two contests but was able to practice on Saturday and is on track to return to game action. Check back for an update/confirmation on Sunday afternoon. Dwyane Wade (head, back) is listed as questionable for Sunday's game against the Warriors. Wade was injured Friday night when he crashed to the floor and hit his head on the court. However, he passed through the concussion protocol and returned to the game. If Wade is ruled out Sunday, Rodney McGruder and Dion Waiters will soak up additional minutes. Jonathon Simmons (left oblique strain) is questionable for Sunday's game against the Lakers. Simmons struggled in Orlando, and now (once he finally gets healthy) he'll be competing for minutes on a stacked Sixers roster. Leave him on waivers. Joel Embiid (illness) is listed as questionable for Sunday's matchup with the Lakers. Embiid has been battling gastroenteritis the last few days. He played through it and logged 33 minutes on Friday, but was 4-of-17 from the field for 15 points (7-of-8 FTs) with 12 rebounds. If he is unable to suit up on Sunday, newly acquired Boban Marjanovic willy divvy up playing time with Jonah Bolden and Amir Johnson. Andre Iguodala (left hamstring tightness) is questionable for Sunday against the Heat. If Iggy is unable to play, Alfonzo McKinnie and Shaun Livington will see some extra playing time. T.J. Warren (ankle) has been ruled out Sunday against the Kings. Warren has been sidelined since January 24th, when coach Igor Kokoskov said the team would be shutting him down for 2-3 weeks. It's been over two weeks, but the Suns may choose to play it safe and hold him out through the All-Star break. Kelly Oubre, Josh Jackson and Mikal Bridges will continue to soak up extra minutes. Josh Hart (left knee) did not practice on Saturday and is questionable for Sunday's game vs. the Sixers. He sat out Tuesday's loss to the Pacers due to the knee issue and was limited to only eight (scoreless) minutes in the Lakers victory over the Celtics in Boston on Thursday. Even when fully healthy, Hart will see his minutes scaled back as a result of L.A.'s recent trade for Reggie Bullock. Hart belongs on waivers. Reggie Bullock and Mike Muscala are expected to be available for Sunday’s game vs. Philadelphia. The physicals have been passed and the paperwork completed, so the Lakers two more recent additions should be all set to make their L.A. debuts. LeBron James (load management) is probable for Sunday's game vs. the Sixers. LeBron rested last Saturday vs. Warriors, but returned on Tuesday and then tallied 28 points, 12 rebounds, 12 assists, three steals and five 3-pointers in 38 minutes on Thursday. He's fully expected to suit for the showdown with the revamped Sixers on Sunday.